Our Locks of Love participants...before! Our Locks of Love participants...after! 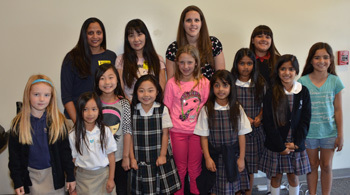 On Monday, March 11, ten volunteer students and five parents and teachers from the Anaheim Hills Campus went on stage in front of their classmates while a Cartel Salon cosmetologist cut at least 10 inches of their hair to donate to the Locks of Love foundation. Students received an educational lesson about why the wigs are made, who could donate hair, the donation requirements, watched a clip of the television show "How it's Made" regarding wig-making, and were able to ask questions about the process to the team of stylists. Before the cutting began, each participant had a chance to tell the school why they made the choice to cut their hair. "My daughter and I are doing this for our close friend, who is currently fighting breast cancer." says Ashley Westlund, the school's secretary whose daughter participated in the event as well. The responses from each participant didn't leave a dry eye in the house. At the end of the presentation, an assembly line of students had their hair cut off one by one as the crowd cheered. 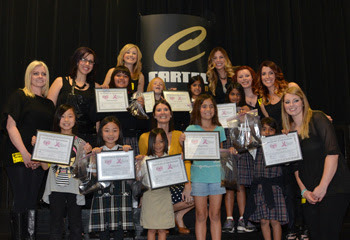 Each girl waved their pony tails in the air to celebrate their contribution. These donations will be used to create hairpieces for financially disadvantaged children in the United States and Canada suffering from long-term medical hair loss from any diagnosis. We are very proud of our students, parents, and teachers for their generous donations. Please join us at Fairmont Preparatory Academy on Thursday, March 28 from 6-8pm for a gala event to launch our new Prep TEC Program. We invite you to join us to hear all about our technology program, including the two years of research and professional development behind it. See the program in action by visiting our department-specific "classroom experiences." You'll be amazed at the ways our 1:1 iPad program will enhance student learning in every class, from calculus to P.E. This event is open to all Fairmont families, preschool-12th grade. Fairmont Summer Programs: Now Enrolling! Hear Ye! Hear Ye! The Fairmont Summer Programs website is now LIVE and accepting applications for all the lords and ladies of the kingdom! Sign up before April 30th to receive a 10% discount on summer school and summer camp.